You've probably had to deal to some degree with facial acne especially during your adolescence. Dealing with white-headed pimples is a pretty easy thing--clean, pop (or puncture) and clean again--but sometimes pimples never form leaving only a red bump that never seems to go away. In this case the oil has been trapped with dead skin inside a hair follicle. Getting rid of these acne bumps requires first opening the pore and then cleaning out the oil. Fill the pot with water and heat it on the stove until it boils. Remove the pot and either pour the water into a separate bowl or leave it in the pot (be cautious of touching the heated sides). Hang your face three to four inches over the steam from the boiled water and place the towel over the back of your head to cover both your face and pot or bowl. Move away from the water if the steam is too hot. 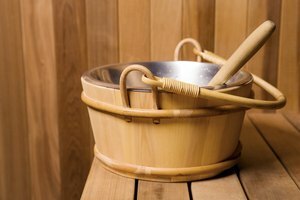 This creates a steam room effect that opens up the pores of the face. Remain in the steam for five to 10 minutes. Wash your face with mild soap in cool water, scrubbing gently with the washcloth in a circular motion. Be very gentle as the skin can be easily irritated at this time. The roughness of the cloth and motion helps remove any dead skin from within the pores. Dry off after washing. Use the facial cleanser or acne cream as directed on the package. Avoid the sensitive areas around the eyes and and nose. Consult a doctor if acne doesn't improve after eight weeks, or gets worse after using the cleanser. For best results use the steam once or twice a week and wash once or twice a day. Washing more than two or three times a day may dry out the skin and make it more susceptible to the irritants that cause acne. Do not under rinse after washing as residue from soap and cleanser can clogs pores. Rinse once and then again, and possibly again once more. Do not use bars, overly harsh cleaners or anything containing alcohol. Each of these contain chemicals that may interfere with natural properties of skin. How Can I Pop a Zit Without it Hurting?